Thanks for the story. I am one of those people who drive real slow to watch them when they are out "in public". Last year, I saw a mom moose and her baby (are female moose really called cows and baby calves?? )on our street. I thought a horse escaped they were SO big! Hi there - long time since I commented, but I do visit often. 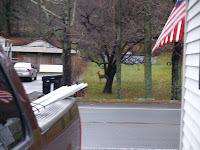 Huge deer was hit the other morning on New Boston Rd; it was lying dead in the road when my husband left for work, along with a bumper and bits of the car that hit it. It was large, and I hope whoever hit it is okay. Just one thing I would like to add: humans aren't harmless to animals. One reason why you see more of them isn't that their populations may be increasing; fact is, we are encroaching on their habitats. Always have, always will.